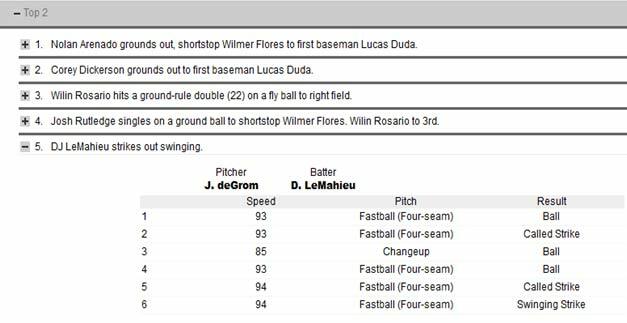 Below is the MLB pitch-by-pitch recap of the second game of the series in New York after leaving Colorado in which D.J. LeMahieu played. His VMI index on baseballvmi.com was -21.82 for the first game (meaning his hitting eye was 4” below the center of the ball with the center of the bat on the 4-seam 94-96 mph fastball). The second game, his VMI index was -14.17 (meaning his hitting eye was 3” below the center of that same pitch). A baseball is approximately 3”in diameter; therefore it is 1-1/2 inches from the center to the bottom of the ball. If the bat is also 3” at the sweet spot; then it is another 1-1/2 inches from the center of the bat to the top of the bat. 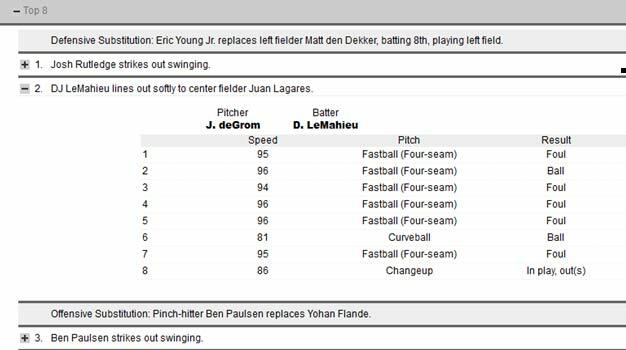 So, on the first day, LeMahieu would need to adjust his visual memory by one inch upward in order to even begin consistently foul tipping the fastball as opposed to swing and miss. In the second game, LeMahieu should begin foul-tipping the fastball (4-seam) in his first at bat as the top of his bat would be closer to the bottom of the ball from adjusting somewhat on the first game day of the series. In the pitch-by-pitch section of the box score re-cap on the MLB scoreboard, one can see enough information to draw some conclusions. Those who do not understand the visual memory adjustment would look at LeMahieu’s performance and conclude he is not as talented as others. However, if he is only going through an adjustment, then on the first strike presented in the top of the 2nd inning (pitch #2 above) he was trying to get a good look at the pitch and didn’t swing; same with pitch #5. On pitch #6 he swung, but missed altogether at 94 mph; Inning over. Here’s the problem: Wilin Rosario had doubled and was on third base after Rutledge singled on a groundball on a lesser lifting 2-seam fastball (mistake by pitcher/catcher). So, LeMahieu left 2 runners on base and dejected (a little) walks to the dugout. Both LeMahieu and the manager Walt Weiss get an “F” on their respective report cards. This “F” enters into the minds of both parties for the next at bat and forward decision-making, as well as, the General Manager’s mind. Does the manager leave D.J. in the game, or substitute him in favor of another player (who is also going through adjustments)? Now advance to his second at bat in the 5th inning. In the top of the 5th inning, he again swung at the first pitch and missed altogether. The second pitch-- he fouled off – probably straight back into the screen. Most likely, after fouling a pitch like that, he began looking for the pitcher to throw a curve or other off-speed pitch, but the pitcher and catcher decided to throw another fastball (even faster) and LeMahieu (probably surprised) did not swing and was called out. However, now he is fouling off the fastball, so he knows what his adjustment needs to be and how much, but too late for this inning, as Rutledge flied out on a 79 mph curveball before him after trying too hard to get a good pitch while looking at a 4-seam strike; and Bergman couldn’t get his eye on three 4-seamers after D.J.’s at bat. Inning over. –What if -- Rutledge was fully adjusted, fully confident and had lined that first pitch into the gap between right and center field? And, what if LeMahieu was fully adjusted and fully confident and had lined his first pitch into the same gap? That’s what happens when teams are confident; then they win! In the 8th inning Rutledge strikes out after completely missing on two 4-seamers (think he’s adjusting?). And then, D.J. fouls off five 4-seamers before lining out on a changeup on the 8th pitch. The Rockies lost 2-0 and had only 5 hits in the game. Oh well, there’s another game tomorrow. AND, the visual memory index for the Colorado Rockies and D.J. LeMahieu will be down to -5.62 VMI or only ¾” below the center of the mid 90’s--4-seam fastball. Since this was game 2 of the series, many times a team can pull out a win in the 3rd game when the VMI is lower. In this case the series went to New York. In game 1 the NY Mets pitcher was evidently afraid to throw 4-seamers (probably due to taking his scouting report from Coors Field) and game three; Colorado lost without scoring. Game 1 -- 9 hits on: – 4 Curves – 2 two-seam – 1 four-seam – 1 Cutter – 1 Change-up; Lost 3-2 on 9 hits. Game 3 -- 4 hits on: -- 1 four-seam – 1 Slider – 1 two-seam – 1 Cutter; Lost 2-0 on 4 hits. Of course, one could argue that Colorado is unique to MLB and that the altitude makes them an outlier in their reaction to the elements presented to them while on the road. While the argument is true; it does not follow that the balance of the players in MLB react differently to the exposure to more ball movement. In fact, since Colorado was granted a MLB franchise, all the teams visiting Colorado for a series have a similar record to the Rockies record in the ensuing series, indicating that every player’s performance is tied to recent exposure to ball movement. One of the complications for the casual observer is the trend in baseball to ignore the elements and take scouting reports on a new opponent from its previous series in order to get a current read on the hitters. The scouting report should include the ADI and VMI of the opponents' previous games, so that the pitcher does not make this obvious mistake.